This topic will go through the clipboard and bookmark function and teach you how you can organize a subset of charts and documents. It will also cover the use of the Share icon and how you can share your charts with other users. 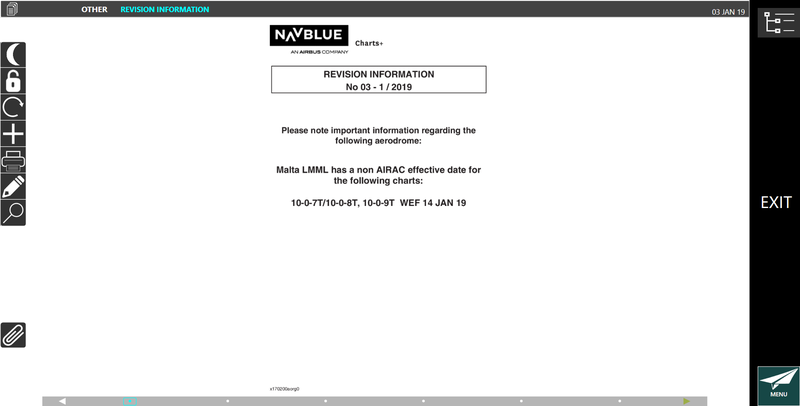 The NAVBLUE Charts+ Windows clipboard provides another way to organize a subset of charts and documents. This applies to workspaces for FROM/TO/ALTN AD charts, Charts AD info, Charts Bulletins, Charts POR/AFB, Company Doc General, Company Docs AD, Charts+ AD Charts, and Charts+ Guide. When any reset behavior is triggered (change the FROM or deploy a package or restart the application), the clipboard is emptied. 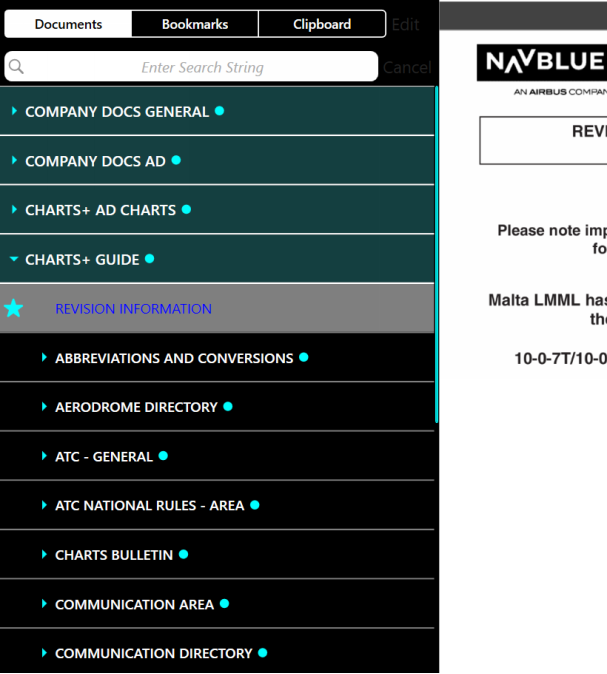 The NAVBLUE Charts+ Windows bookmark will provide you another way to organize your documents (only for Company Docs General and Charts+ Guide). It will enable you quickaccess to your documents. Please note you will not be able to bookmark any AD chart. Contrary to the clipboard, the bookmark is not emptied when a reset behavior is triggered, however, an uninstallation of the application will remove all bookmark entries. Let's go ahead and add some charts and documents to the clipboard and bookmarks. Let's start by adding this chart to the clipboard. The paperclip image with a + sign indicate the item is not on the clipboard. Let's add it now. You can see that the paperclip has changed to blue with a - sign. This indicates the item is already in the clipboard. 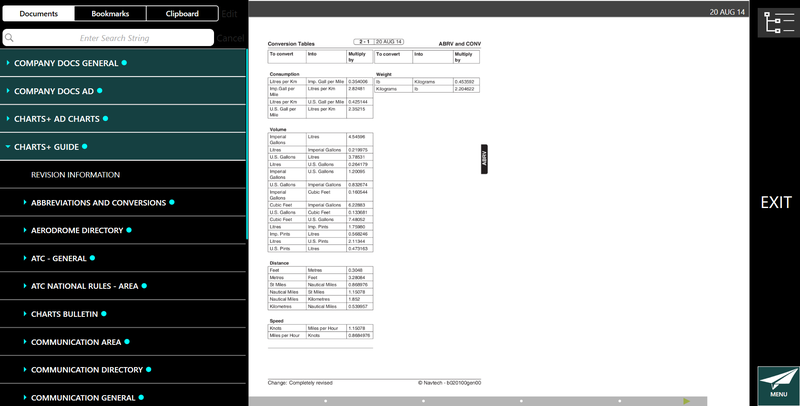 The following paperclip will appear above the quick navigation toolbar to show you that a document or a chart are in the clipboard. 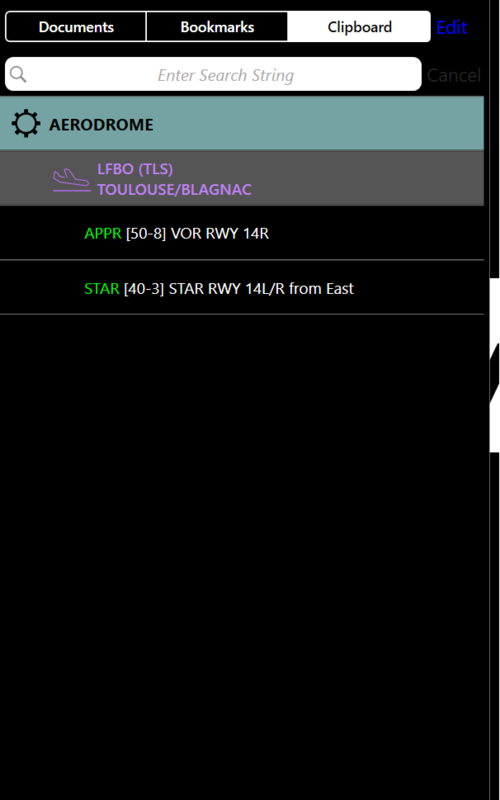 Click the Star FJR 6L cell. Let's add the following chart to your clipboard. Now that you have added some charts let now go and view them in the clipboard. 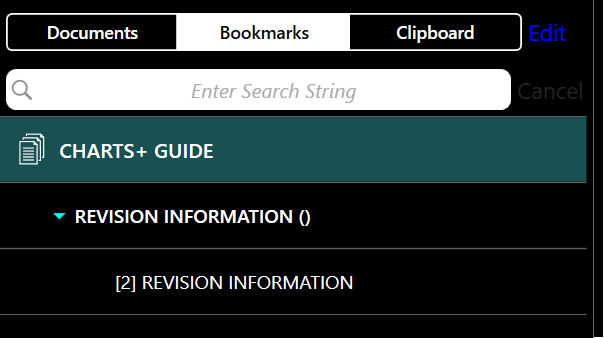 Click the Clipboard paperclip button. You need to make sure that the clipboard tab is highlighted. You can see your two charts that you applied to the clipboard. 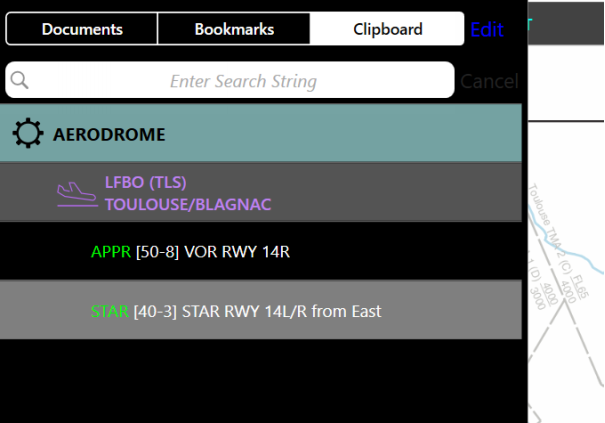 Click the STAR 40-3 STAR RWY 14L/R from East list item. There are two ways to remove a clipboard item depending on where you are viewing the chart. We are currently viewing the chart in the clipboard so you can remove the chart from this menu first. Click on edit to access this option. Simply clicking on the delete symbol will allow you to remove the chart. Clicking and dragging on the three lines will allow you to re-order your list. Clicking delete will remove the chart. You can now see the chart has been removed. Let's now have a look at bookmarks. Click "Done" when complete. Let's have a look at some documents to bookmark. Click the Charts+ Guide menu item. Click on the folder you wish to view. 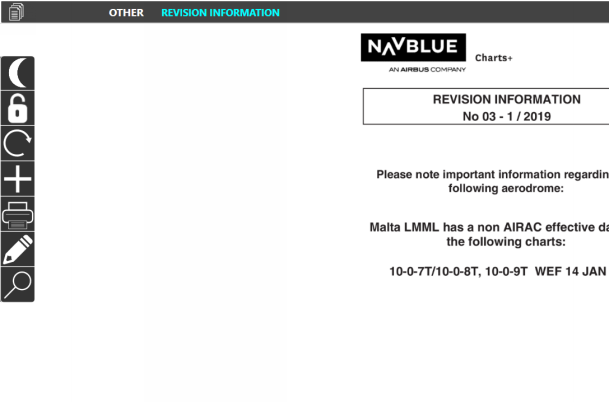 Click the Revision Information list item. 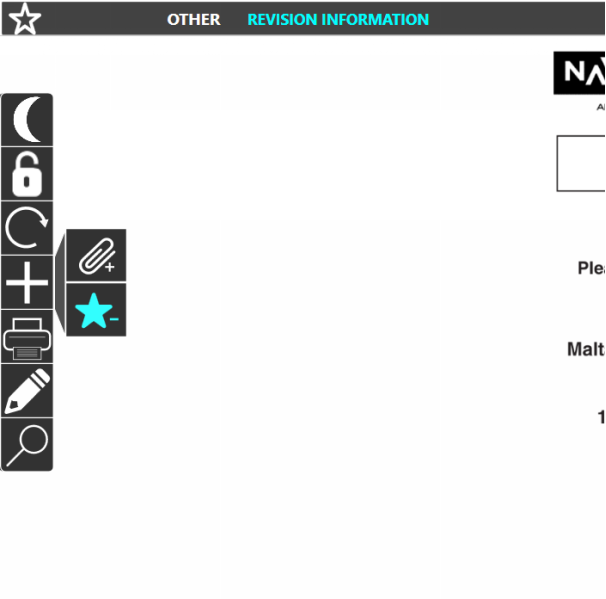 You are now in the Revision Information document that you selected. You can now bookmark this document. You will notice that you have two choices of what you can do with this document. You can either clipboard it by clicking on the paperclip or you can bookmark it by clicking on the star. Let's bookmark this page. 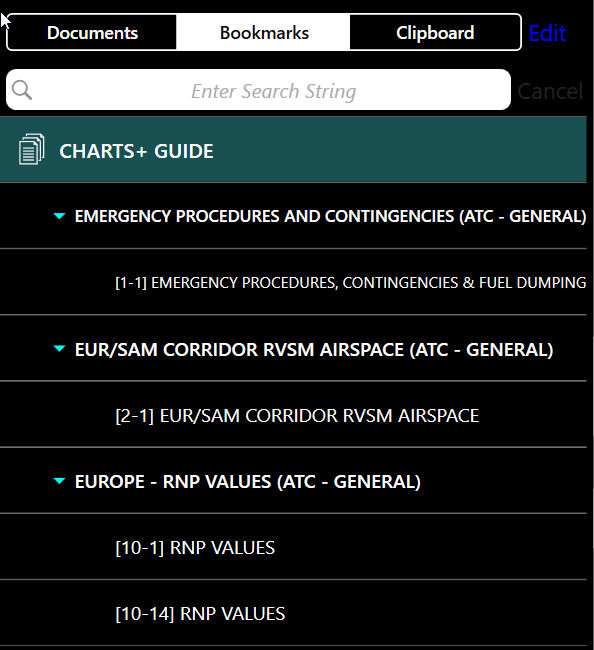 You cannot add aerodrome charts to bookmark, only Company Docs General and Charts+ Guide. Click the Charts+ Guide list item. As you can see your bookmarked document has been added successfully. 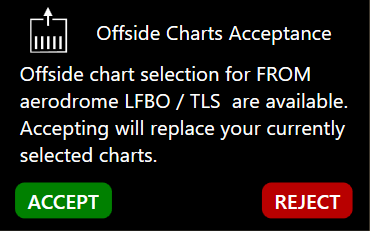 Just like you did in the clipboard section you can remove this chart by going to Edit and deleting the chart. Another possible way of checking if your document has been bookmarked or clipboard. 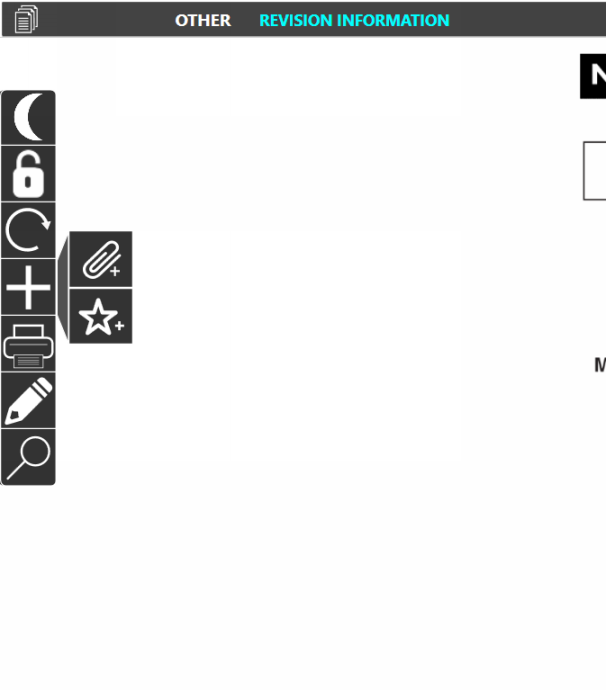 You can see that the bookmark star has gone blue with a - sign which will indicate the item has already been bookmarked. You can remove it by clicking the star again. As you can see the bookmark has been removed. 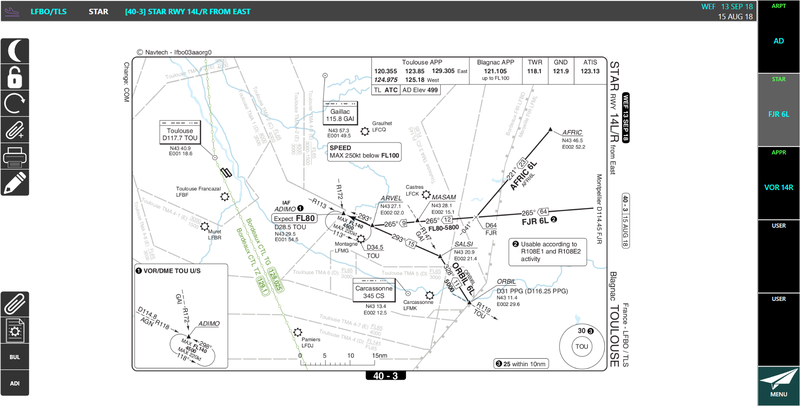 Your chart administrator can specify default charts for an aerodrome. 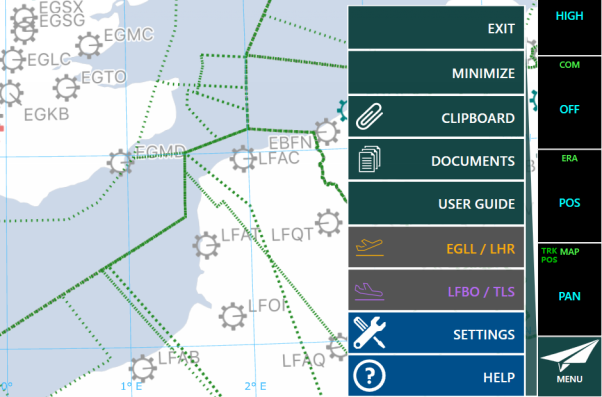 Default charts defined by your chart administrator for the route identified on the enroute screen are initially assigned the chart screen ribbon tiles if you provide the correct entry in terms of departure, arrival and either departure or arrival runway. You can, if you choose to, assign a different chart. 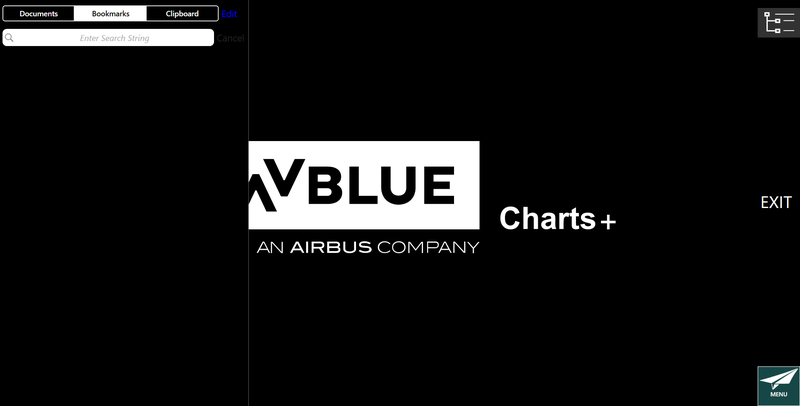 The Share Charts functionality allow you to share your chart selection to the other pilots present in the cockpit. If the resolution and orientation are the same, the zoom and pan are sent as well. However, annotations and sketches are not sent. Please refer to Installation course to set the eCharts.Setting.ini file. In the setting (see Settings), you must set to ON the "Enable SHARE Charts" setting. Located in the application settings you need to make sure Enable Share Charts is turned on. 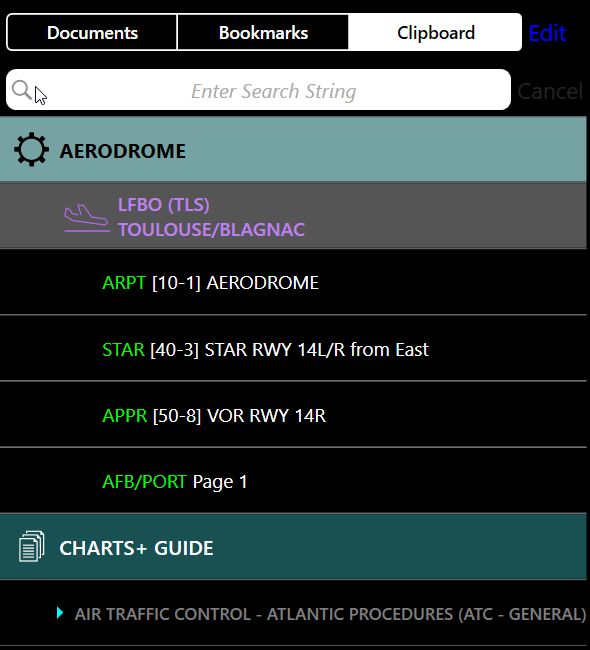 To use share charts functions, you need to make sure that all devices must have the same airport configuration (FROM, TO and ALTN) setup. Once this done, in the chart workspace if all requirements are met for the different device to communicate then this icon on the toolbar will display automatically. There is no manual connection to establish the communication. 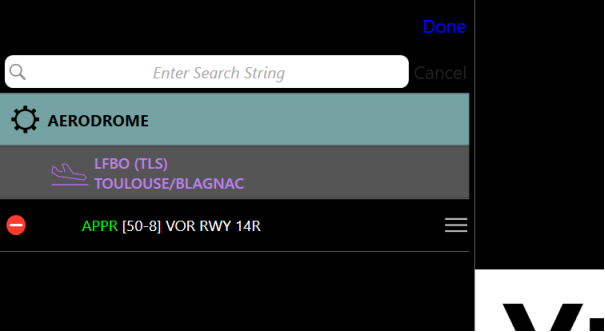 When one pilot click on the following icon, it will broadcast to all set devices in the cockpit the charts selection, rotation, zoom and pan. 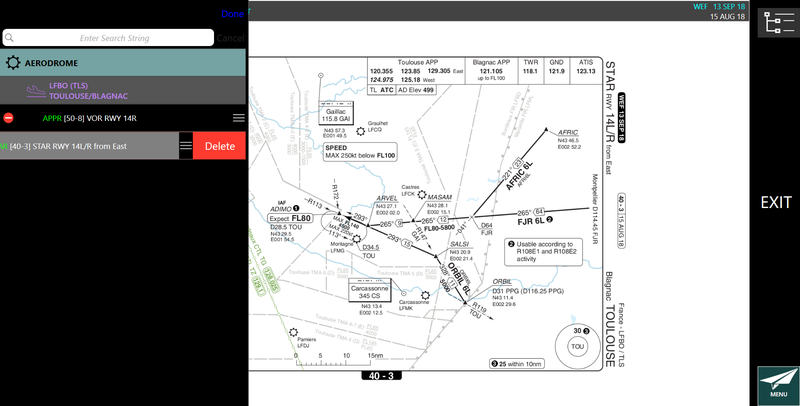 Other devices will receive a notification and pilots can accept or reject the charts selection. 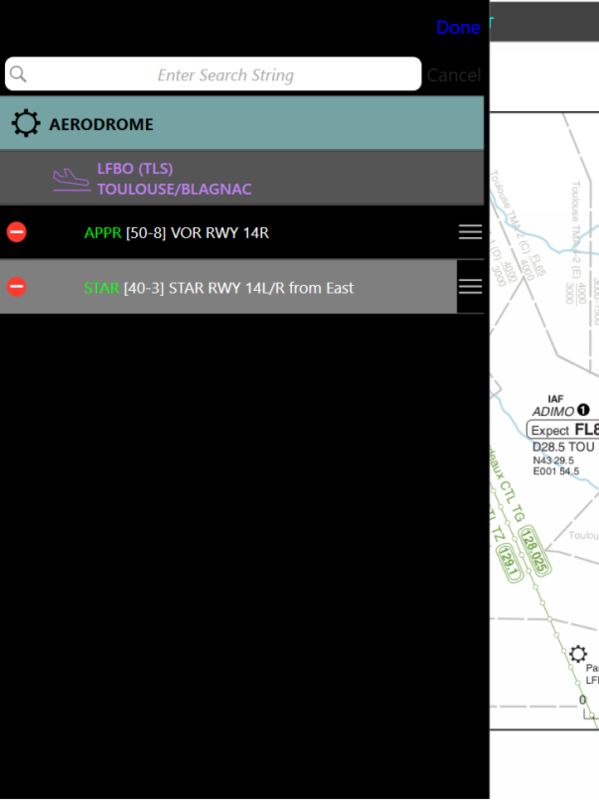 This notification is shown whatever the current workspace open in the application (terminal charts - any airports, document viewer, enroute map). 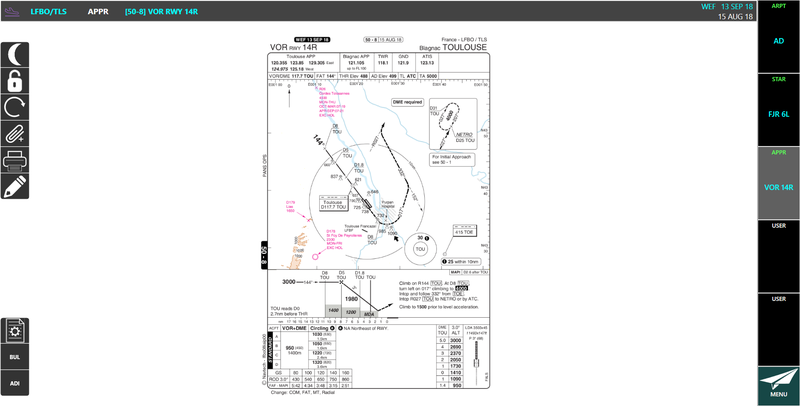 If the pilot receiving the chart selection choose to accept the notification and is not in the terminal chart workspace, the workspace is changed to display the current selected chart from the sender. 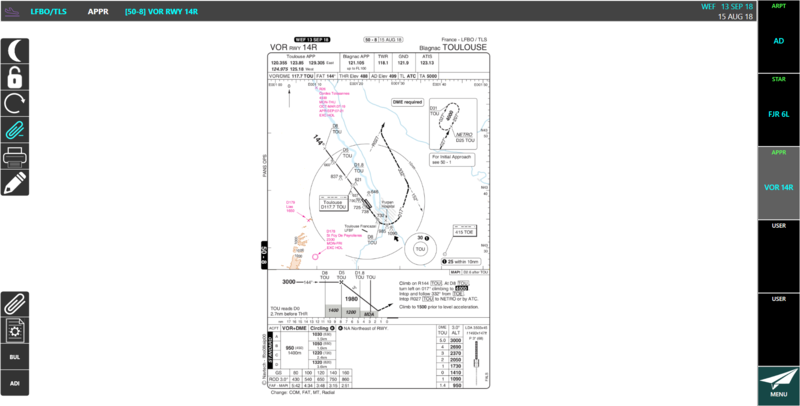 If the pilot receiving the chart selection choose to reject, the notification is hidden and the current workspace is not changed. Notification you can either Accept or Reject the charts selection.